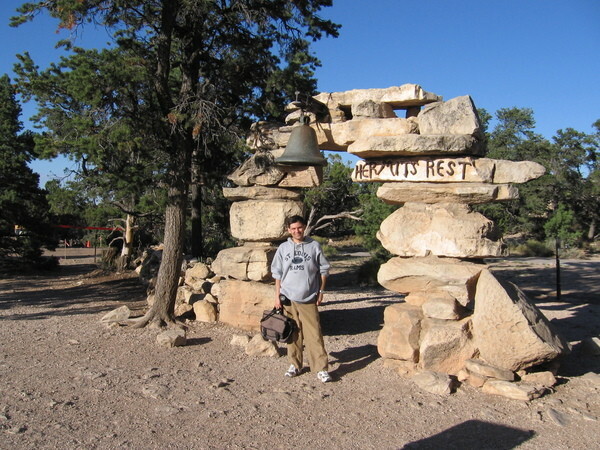 May 18, 2006 I had told everyone that I was going to see the sunrise on the rim. The other campers thought that would be nice as well, so we got up a bit before 4am local time (6am central daylight time... not too bad) and we left to catch the appropriate shuttle busses about 4:15-4:20. Before that, we put together all of our sleeping supplies so that Bob could load them into the van. We caught the blue shuttle at 4:30 and took it over to the red shuttle transfer. The red shuttle came and left at 5:05, and we were at Hopi point a minute or two before sunrise at 5:20ish. Sunrise was reasonable. Not as colorful as the previous sunset, but still reasonable. Song decided he was going to head back into the main market area, but the rest of us got on the next shuttle and headed farther west along the south rim. At the Pima Point overlook we got off the shuttle (the driver said they were going to be there for a couple of minutes, so we could look around if we wanted) and we ended up deciding to stay off the shuttle and do a small amount of hiking on the south Rim Trail. We walked from Pima Point to the last shuttle stop ( Hermit's Rest) which was about a mile. At one point I think we were too close to the edge. The trail actually started descending into the Canyon, and the Rim Trail didn't do that. So, we backtracked a bit and found the real trail and took it on down to Hermit's. The shop at Hermit's rest wasn't yet open (it didn't open until 8am or so), so there wasn't really much to do there. The view from there was less than stellar (about the only thing you could see was the remains of the Hermit's cabin down in the canyon), so we caught the next shuttle to come through and took it all the way back to the main village area. We met a lady on the shuttle that had hiked the Canyon 20 or 30 years earlier. She had come back out to see it again with her fiance, and her fiance was particularly impressed that she had hiked it. We were ready to catch the blue shuttle when they told us that it would be 3 or 4 minutes, so Nick and myself walked up a little hill to where they had the collection of mules waiting at the end of Bright Angel trail. I took a picture of Nick standing next to a mule, and I saw a couple coming up out of Bright Angel trail. At this point it was around 7am, and the sun had only been up for an hour and a half or so. The Bright Angel trail, while one of the easiest ways to get to the river, is still somewhat long (8 or 9 miles?) and does come up all the way from the river. So, I joking asked the couple if they had hiked out from the river that morning. The most logical thing would be that they had walked down in a little ways and were just walking back up to the rim. The guy responded "yes". Then he said, "actually, we hiked all the way from the North Rim". That's a 23 mile hike, so I figured he was joking. Come to find out, they had, indeed, left the North Rim the previous morning and hiked down to the river. The couple said they had a campsite reserved at the river, but the ranger stationed there disagreed. They were told that they could either get a criminal record for trespassing, or they could hike out. So, they hiked all night long and were just getting out of the Canyon. They weren't happy. They said that they were going to "the office" to file a complaint. My take on it is that they had messed up. The odds are extremely high that the ranger knew what he was talking about, and their permit was not for the right night at the site where they were trying to stay. But, that incident provided for some interesting conversation. We got on the Blue shuttle, and got off a stop or two later and people ate breakfast at the restaurant at Maswik Lodge. As we were waiting to catch the blue shuttle after that, I was noticing that the backcountry hiking office was just a tenth of a mile away, and the blue shuttle went right by it, so all of us just walked over to the backcountry office to check it out and figured we'd catch the blue shuttle there. The blue shuttle was actually coming as we got there, so we didn't have much time to explore, but there wasn't much to see anyway. It basically consisted of a display or two, a bunch of "desk copy" books that you could browse, and a desk with a couple of rangers answering questions. I was hoping for more displays and information that was readily available for reading. But, that wasn't meant to be, so we just got on the Blue Shuttle and headed on along the route. We went to the eastern end of the Blue route and caught the green shuttle. The green shuttle took us out to Yaki Point (passed the South Kaibab trail along the way.. the 2nd of 2 paths that the mules take down) We looked around Yaki Point for a while, and caught the green shuttle back. 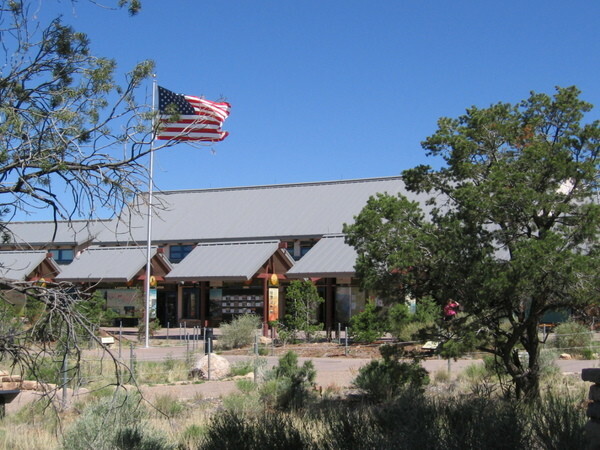 The blue shuttle/green shuttle transfer is at the official Grand Canyon visitor's center. There was a geology talk at 10:30 that David and Rachael were planning to watch, so we had an hour or so to burn before that. We looked around the displays (I remembered a lot of them from the last time I was there, actually). The temperature display was useful. It said that the temperature the day before at the river was 102 degrees. Going to be warm... Nick and myself met a lady inside the center while we were looking at the relief map that had hiked the Canyon 20 or 30 years ago with her kids. She was nice to talk to. Once we finished chatting with her, we happened across Bob, and told him that we would be done with doing our exploring long before the 3pm meeting time that we had set up before. So, we moved the meeting up to noon. Bob said that he'd seen Song down near the general store, and the rest of us were around there, so we decided to meet at noon. At 10am, Nick and myself (and probably some others) watched a Welcome To The Canyon talk by a ranger who was very calm. A gentle, slow talker that took things pretty easy. We already knew everything that he was saying ("Shuttles exist. 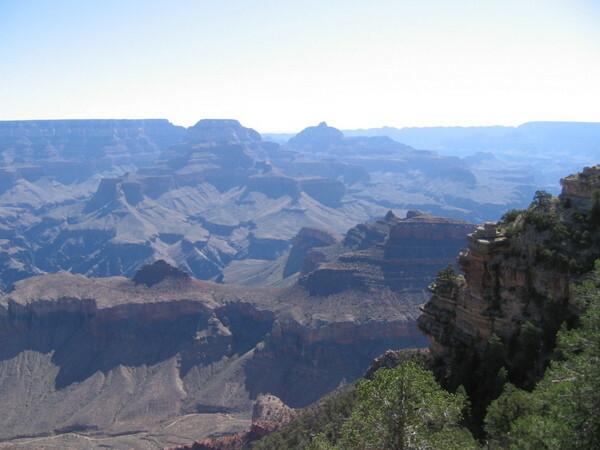 The Canyon is 277 miles long", etc etc) but it was a reasonable thing to sit through, anyway. From there, we stepped outside for the 10:30 geology talk. Imagine a person 180 degrees different than the ranger described above, and you have Lori, the extremely peppy ranger who gave the geology talk. I'm pretty sure she was talking loud enough for people down at the river to be able to hear her. No one fell asleep during her talk. She described the history of the Canyon more than anything else. I was hoping for more of a talk that described the actual layers of the Canyon in more detail, but that wasn't what we got. She got done about 11:15, and we hopped on the blue shuttle and headed back to the general market area. We ate at the cafe across from the general market, and again caught up with Bob and, this time, Song. Bob said to just meet him at the van in the parking lot when we finished eating, so the 7 of us (not Bob) ate lunch. I had a supreme personal pan pizza and a diet coke. We then got in the van and headed to our campsite. We didn't go back to the group campsite from before. Bob hadn't been able to get it, so we went to a site that was down one row from the earlier site (new site: #269). Once there, Bob started setting up supplies. I had some electrical devices that needed recharging, so I went to the bathroom (left side of the building for men, right side for women) and plugged in my cell phone along with a recharger for a camera battery. I got back, and we had a camp meeting. During the meeting, Bob went over the information on the backcountry permit (no trash dumping, it's hot, etc etc) and other rules (must use food bag, trash still goes in the food bag, carry out what you carry in, etc etc) and then handed out the food for the trip. Each of us got a personal goodie bag filled with GORP, starbursts, tootsie pops, oatmeal packets, koolaid packs, granola bars, cup-a-soup packets, Gookinade ERG, and some other stuff. Bob told us that we could do whatever we wanted with it. We could eat it all that day, or we could save it to use over the course of the trip. We also got a bagel bag full of 10 bagels and English muffins. Then, there were group items. The most prominent being the days' food items. I ended up with day 2 meals. It was a couple of largish ziplock bags. The other days were spread out among people. Then non food items. I got the water filter and spare fuel for the camp stoves. There were 2 camp stoves, large and small pots, orange trowels for digging holes, camp spoons, etc. These items were divided among everyone. We were then given the directive to load our backpacks. (Some background on the backpacks: The backpacks were provided by the division of Campus Rec. I had picked mine up the Tuesday before the trip began and walked around with it some to get used to it, and then loaded items into it that I knew I wouldn't need before "right now". We then took the packs back to the outdoor rec center on the Friday before the trip, and they were hidden away in the back of van until "right now". So, we had the backpacks out, and they were filled with these things that we thought we wouldn't need until we actually started the trip down into the Canyon. I had a couple of quarts of gatorade in mine, along with emergency camping supplies (first aid kit, signal mirror, whistle.. stuff like that) So, after this meeting, we were told to pack the pack for real. I took that opportunity to go pick up my recharged items. Nick had gone to the bathroom at the same time, and this was the point that I realized that I had, in fact, put the recharger in the women's bathroom. This bath house was arranged exactly opposite of the previous one. In this place, the women's bathroom was on the left, and the men's was on the right. So, I quickly hopped back into the women's bathroom and picked up my supplies and got out. Later that day I copied all of my memory cards off onto the digital wallet along with one of Rachael's XD cards. Song realized he didn't have a lot of the items that he was supposed to have (water bottles, for instance) so he headed to the general store to pick them up. The rest of us spent the next hour or so getting our backpacks ready for the journey ahead. After that, we decided to go look around at the general store (we were going to do that earlier, but the meeting got moved up, which caused us to rearrange our plans) On the way to the store, we met Song heading back to camp. He had purchased the items he needed, and all was well. We walked a bit farther and Song came running up saying that there was another store than he needed to go to, so we watched him head off. At the store, I found an "it's your world. Go hike it" Grand Canyon shirt, so I bought it. Got a sandwich that I split with Lucky for supper. A couple of hours after getting back to camp, Song still hadn't shown up. We decided to take it easy for sunset. No real picture taking, but we wanted to go back to the rim to look around. Right before heading out, Song shows up. He's decided he's not going into the Canyon. He had gone somewhere to read email, and something happened that made him decide to not go into the Canyon. Instead, he had arranged a bus ride to Las Vegas, where he was going to meet up with someone he knew, and then catch a plane flight to Champaign the following Tuesday. So, the Canyon claimed its first victim from our group. Bob had managed to stay busy with the van the whole time, rearranging this and that. Rachael, David, and Nick have been telling people which trails we are doing, and the response is generally, "wow". Apparently these trails aren't the easiest ones in the Canyon. I tell them to quit asking people's opinions if they don't want to hear the answers. :) They said that they weren't asking. They say that they are going to hike, and people ask them which trail they are taking. Fair enough. We got the full trip plan from Bob during the meeting. It told us which trails we'd be taking, the approximate length of each day's hiking, along with relevant elevation changes, along with a map. It would have been nice to have this piece of paper pre-trip. I could have done more investigation that way. Showers at Mather campground cost something like $1.50 for 5 minutes. A couple of people decided to take showers. I didn't. While in the Canyon there won't be any showering. No soap or deodorant is even allowed. The wind was blowing pretty well while we were waiting for sunset. It actually got a bit chilly. I put on my fleece long sleeved shirt. A deer walked right by camp today. Yesterday we had an elk and a raven right next to our campsite. Headed out for the night's festivities. We decided to go to the Bright Angel lodge area for sunset. It had a gift shop owned by a different company (different t-shirt sayings that way) and other things to see, so we decided we'd poke around there before sunset. Only problem was, the sun decided to hide itself behind clouds as it dropped below the horizon. So, we didn't see much of a sunset. However, we hit the gift shop. I managed to find a mug that says something to the effect of "I complained, griped, moaned, got sore muscles.. but I hiked the Canyon". Right outside the gift shop, Nick and myself saw the couple that had walked out of the Canyon that morning. I had him take a picture of them so that we'd have their faces recorded for all time. We dropped by the Kolb Art gallery. Amazing paintings in there. I like the ones that look like a photo from a distance, but look quite hideous when you get up close to them. Not enough to pay the multi-thousand dollar prices that they were asking... but they looked cool anyway. The gallery is right on the rim of the Canyon. You can look out the windows, and look straight down for several hundred feet. I can't imagine having such a view in my bedroom. However, when than building was built, I'm sure that the inhabitants were so blessed. 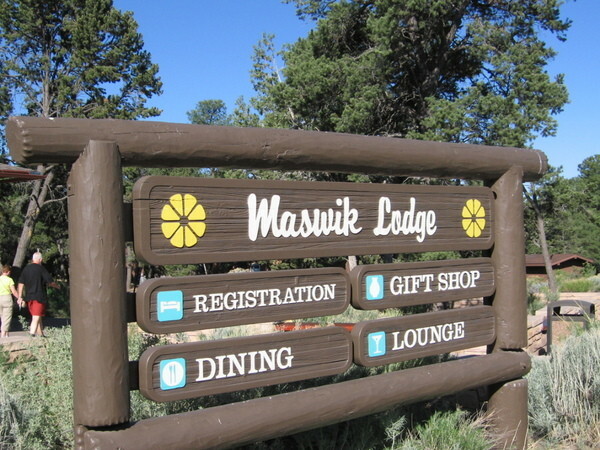 On the way back to the campsite, we chose to divert through El Tovar lodge so that we could see how nice it was. We went in the backside, which had hallways that looked like your typical hotel halls. But, when we got to the main lobby area, it was 2 or 3 stories high, and had lots of informal leather couches and chairs set up for having impromptu meetings. There were a couple of stores in the lobby, so we poked around in there for a while and then decided to head on back to the campsite. We caught the bus back to the campsite and got off at the campground stop. Well, Rachael, David and myself did. Fabio, Nick, and Lucky stayed on the bus because they wanted to go pick up a couple of things at the general store. Rachael had her Illinois sweat shirt on, and as we were walking down the lane, a guy we met said "UIUC!". Come to find out, he had graduated from UIUC the previous week. I told him that we were all from UIUC and were going down in the Canyon for six days. We were on the campus rec trip, etc. When he heard that we were going down in the Canyon he was like, "really? Oh, you're on that trip with the guy who really knows what he is doing, aren't you?" Bob should feel proud. Anyway, this guy was a music major, and knew a Dave Kohn, whom David also knew.